Having been involved in a letter-writing ministry of encouragement (Epistle Sports Ministries) for over 30 years, I've come to appreciate more and more the value of a greeting card...sent with love. Over the years I've sent literally thousands of cards. I've also received more than my share of heartfelt greetings. They are always such a pick-me-up. One such card from a dear friend changed the course of my life when I was ready to leave the ministry. I've given this card (pictured below) to several godly men who have impacted my life with their biblical counsel and Christ-like living. Recently I received the same card from my friend David. I didn't feel worthy of the sentiment but I was certainly grateful and moved by his expression of Christian love. There are so many excellent cards available in Christian bookstores these days. 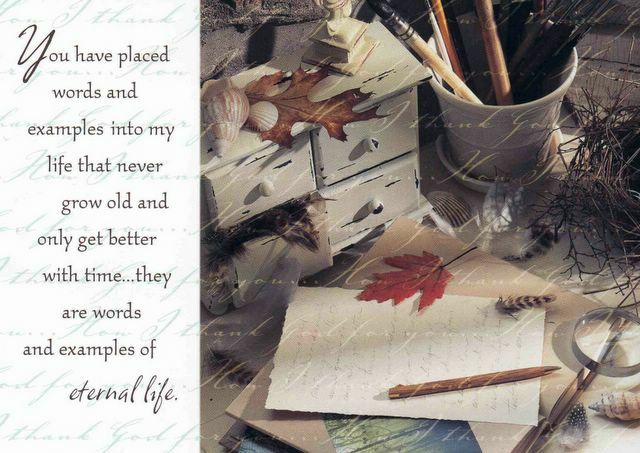 The Dayspring card line like this one is exceptional. Our own Canadian company, Lawson Falle, have some excellent lines of cards. I've always been partial to Hallmark cards and they print some great sentiments as well. When I think of the impact that can be made by sending a card, I wish more Christians would avail themselves of this ministry. A single card can be fairly pricey but you can buy a box of 12 cards for $5.00 or $6.00. This brings the price of a single card down to approximately 50 cents. Add a stamp and you can encourage and refresh a weary pilgrim for only $1.00 and, perhaps, literally change their life. So, fellow pilgrims, from an experienced veteran, I challenge you to write a friend today. Pick up some cards at your local Christian bookstore, write your Spirit-inspired greeting, add a stamp, drop the envelope in the mailbox and trust God to do His work of blessing and refreshing!